Like many, Thanksgiving is my favorite holiday of the year. It is a day out of the hustle and bustle of normal fast-paced life to be with family and give thanks for everything you have, and in some cases, give thanks to what has come to an end – like an unhealthy marriage. However, even if you are happy to be divorced or recently separated this year, Thanksgiving and other holidays may still be a difficult and emotionally challenging time. Traditions that were made as a family are tender reminders of what once was, and for those with children, an even more challenging time. 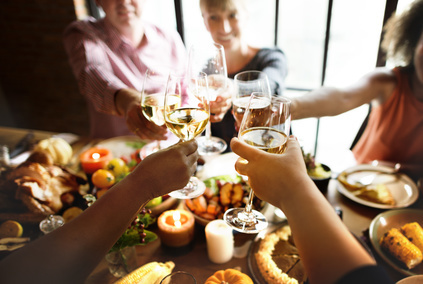 If you are dealing with divorce or separation, here are a few ways that can help you stay thankful and enjoy this year’s Thanksgiving. Although your family has changed, past memories will still be lingering. New traditions will help keep you focused on the present and the relationships you have maintained throughout the hard times. If you have the kids this Thanksgiving, create a new tradition for just you and them, which could be anything from a certain craft project to a trip to the mountains. Consider volunteering with a charity or local soup kitchen this Thanksgiving to keep your mind off the past and focus on helping those around you. Post-separation is a great time to get in shape so sign up for a turkey trot in your area and meet new people to connect with. Co-parenting around the holidays is very important. If you have a parenting agreement or court order, then the holiday should be clearly outlined as to who has the kids and for how long over the holiday. If your children are young, then you will have many years of co-parenting over the holidays and it is important you start open communication and flexibility right from the beginning. Putting your children first and your resentment last will help you ensure that their Thanksgiving will be one they will thank you for, regardless of which parent they are with. Holidays are a busy time for everyone, especially Thanksgiving, but friends and family may be surprisingly eager to pull up an extra chair and break bread with you this year. Just because you are feeling down doesn’t mean you should spend the holiday alone. If a friend or family member offers an invitation to join them this Thanksgiving, accept that invitation. Not only will it keep your mind off the poignant memories of the past, but will help you be thankful for the relationships you have now. If you are concerned you might bring the party down, try talking to someone beforehand so that negative feelings are kept at bay and you can relax and enjoy the festivities. If your ex has the kids and your friends and family are off celebrating on their own, or you just don’t feel up to socializing, treat yourself this Thanksgiving. As always, there are myriad of businesses open on Thanksgiving, and the day after, offering the best deals of the season. Take some time to catch up on reading or movies you have wanted to indulge in, or tackle that house project you never seem to have time for. If the kids are away, coordinate a phone call or face time visit with them. Remember, they will be coping with the change in tradition as well. However you spend your Thanksgiving, make sure you take care of yourself. Life transitions are never easy, and holidays may escalate your emotions. By taking steps in a positive direction and embracing your new life, you’ll be able to enjoy the holidays again. This Thanksgiving remember to give thanks. Make a list of everything and everyone you are thankful for, I bet the list is much longer than you expect.